I’ve always been a bit puzzled about the release of the Official Stills. Maybe that’s just how it works with TV shows in general, but: Sometimes we get 20 Official Stills for an episode – another time only 3. Or worse – none. 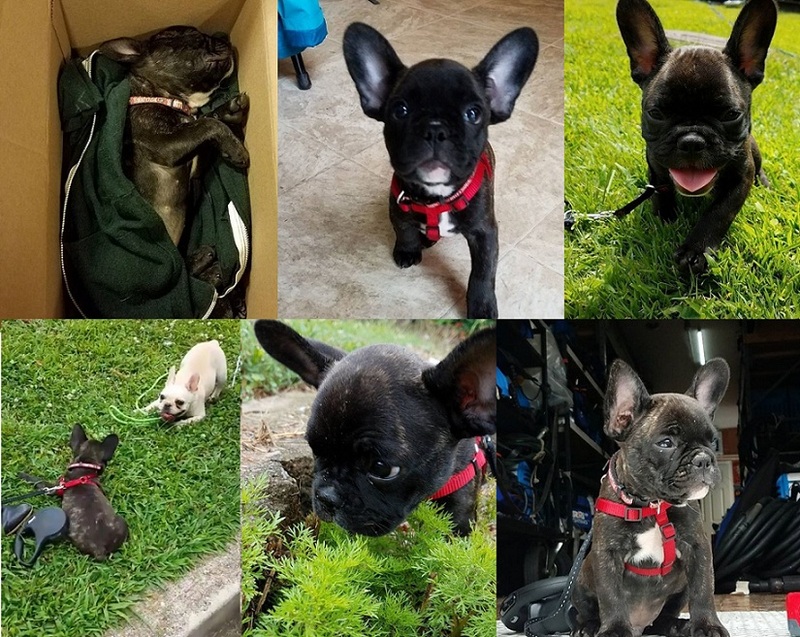 Sometimes we would get several, but all of them looking very similar. I’m still not sure who actually chooses them – according to Set Photographer Guy D’Alema, it’s not the photographer himself. So either the director of photography, the director of the episode or the producers? Or someone higher up at CBS who’s responsible for TV show promo in general? No clue. In Season 1, there weren’t many in the bunch that actually sparked my interest, but it was fun to look over them months after the episodes had aired. One thing I have noticed: While for Season 1, there had sometimes been 2 or even 3 Still Photographers, it’s usually only one person now (mostly Guy D’Alema who works on a bunch of other TV shows as well at the moment). We got 5 Official Stills via SpoilerTV. Three of them feature MacGyver, one Jack all on his own and one has Mac and Jack in trouble. MY FAVORITE: Probably the one with Mac and Jack in trouble. We’ve seen BtS pictures of the scene before and I was curious what this was all about. NOW THAT’S DISAPPOINTING: We already knew about Isabel Lucas being a new regular cast member, but there was no Official Still of her (or the other cast members). Funny thing though that the person grabbing Jack’s leg IS actually Isabel as Samantha Cage. For the second episode of Season 2, we got 4 Stills via SpoilerTV. 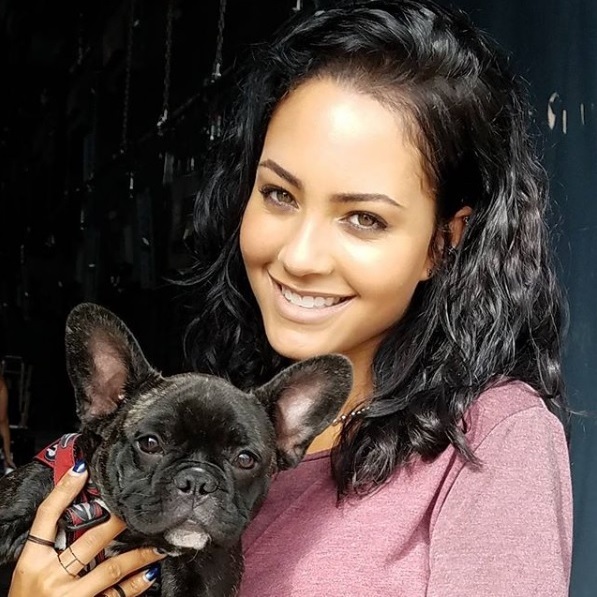 Interestingly, they are all about the same scene with Tristin Mays as Riley; but one Still features a guy that isn’t all that important in the end. MY FAVORITE: Not much to choose from, huh? I guess the one with Riley on the computer *heh*. NOW THAT’S DISAPPOINTING: As mentioned above, all of the Stills advertize the same scene. The episode is clearly centered around Riley, but I always think it’s weird when the protagonist that lends the show its name isn’t seen anywhere. Also, given the episode title, I had actually expected that the Muscle Car (a Mustang in this case) being featured. The third episode delivered 10 Official Stills via SpoilerTV. Besides Matty, everyone of Team Phoenix is in more than one of the pictures, which is nice. 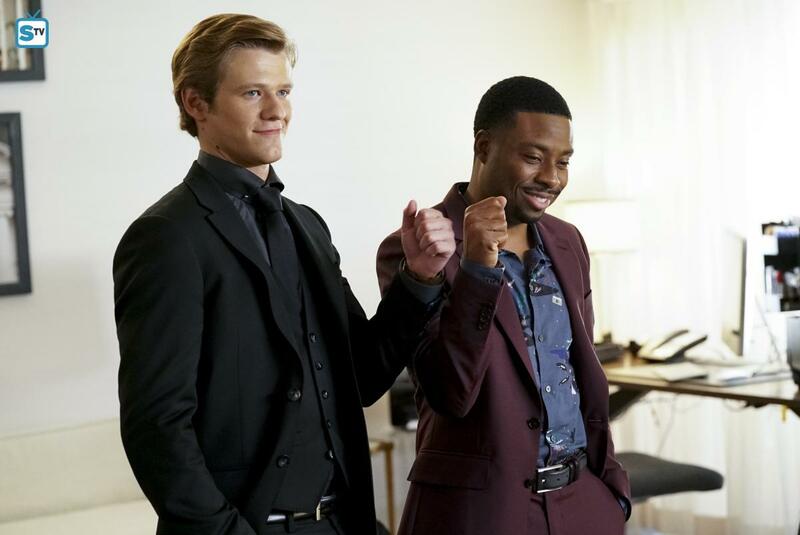 MY FAVORITE: Mac always talks about Bozer being his best friend – but since he joined Team Phoenix, Lucas Till and Justin Hires didn’t have many scenes together. Although this scene features the entire field team, it’s nice to have two Stills with just the two of them – I think that might actually be the first time since the Pilot Episode. NOW THAT’S DISAPPOINTING: Nothing, really. The cast is very pretty to look at; the women all dolled up and the men all sharp dressed. In a Still that was added later on, there’s even a SAK featured. Isn’t that great? It’s actually my runner-up choice, so it needed to be shown as well (right at the beginning of this blog post). We got only 3 Stills via SpoilerTV. All of them feature the scene with Mac and Murdoc. MY FAVORITE: The one with Mac and Murdoc, of course. NOW THAT’S DISAPPOINTING: There’s the promise of Mac!Whump; so for me, not disappointing at all. There was even a BtS video after Entertainment Tonight had visited the set when this episode was being filmed. The Halloween Episode brought 9 Official Stills via SpoilerTV plus additional versions of the group photo with everyone besides Matty dressed up in their Halloween costume. MY FAVORITE: It’s either “Jungle” or “Costumes”, so probably the group photo with everyone trying to look scary. NOW THAT’S DISAPPOINTING: For the costumes being featured in so many pictures, it was a bit disappointing we didn’t get to see them properly in the episode itself. But when it comes to the Official Stills, everything’s fine. Maybe a Still with the villain would have been a nice addition. Everything’s different on Halloween. 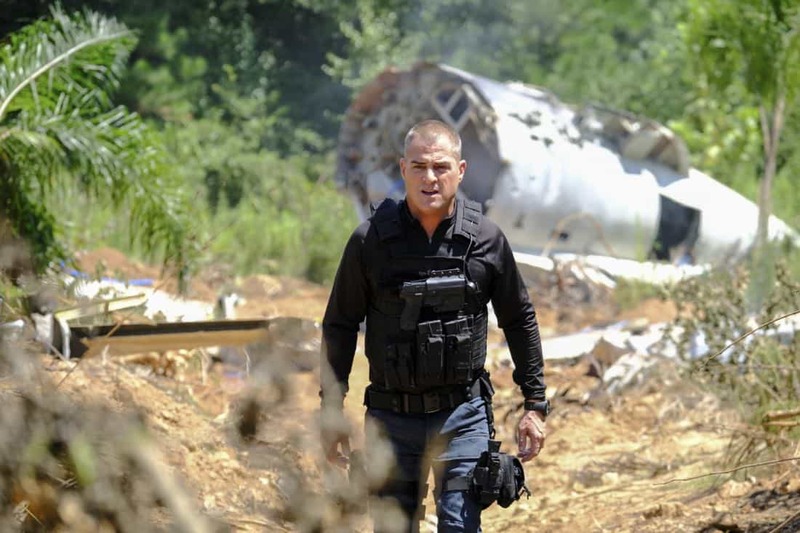 Tonight, the newest Episode of MacGyver airs an hour later than usual; making way for the Michael Jackson Halloween Special with characters voiced by Lucas Till and George Eads. Looking at the upcoming schedule, episodes are airing weekly up until at least mid-November, so filming goes on without too many days off, as well. Cast and Crew weren’t seen outside very often, but Mike Martinez revealed on October 18 that they had done more water tank work. 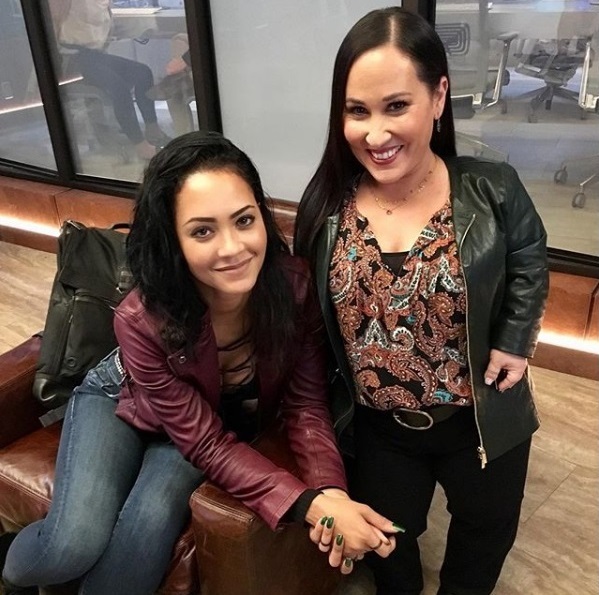 Every now and then the cast keeps posting pictures of different episodes – Meredith Eaton provided several with her co-stars (e.g. 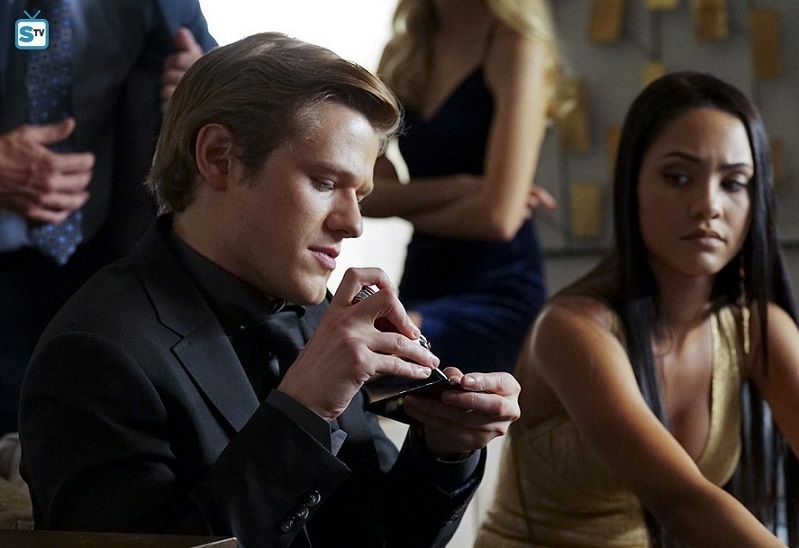 with Tristin Mays and Lucas Till). 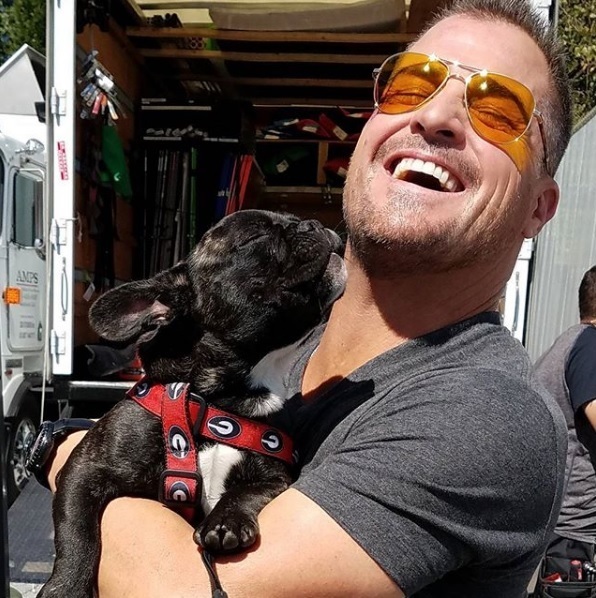 George Eads was on a roll and posted more pictures than ever; e.g. an old BtS picture of him with the Aston Martin in Episode 1×17 (Ruler), in a stare-down with Matty or of him with the crew, looking all dangerous. 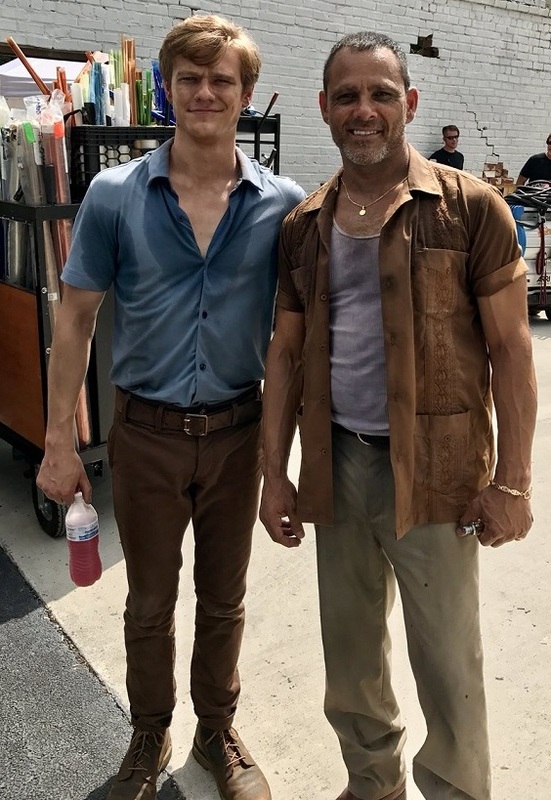 Justin Hires keeps uploading short videos from set and BtS pictures of aired episodes, but he also posted a picture of the upcoming Episode 2×06 (Jet Engine + Pickup Truck) or of Bozer posing with Matty. Isabel Lucas doesn’t post much, but shared a picture of her on the hood of a car. Justin reminded us that Sparky is part of Team Phoenix as well. Tristin shared a video of her driving a Sanitation Truck. 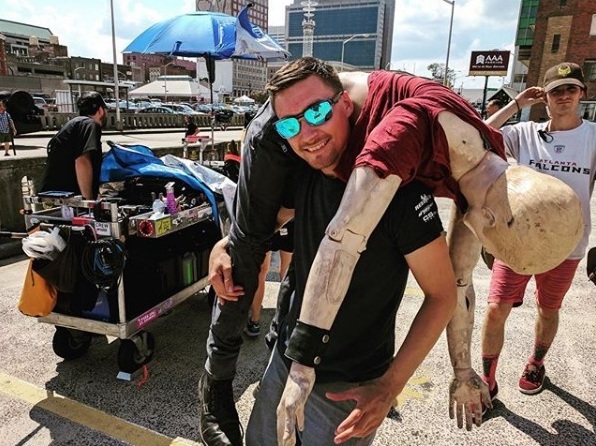 Despite all the work, the crew still has fun on set – e.g. by working in their pyjamas, creating graffiti together on their breaks or playing puppy with the slate. Episode 2×11 (Bullet + Pen) is the Christmas Episode, directed by Carlos Bernard. 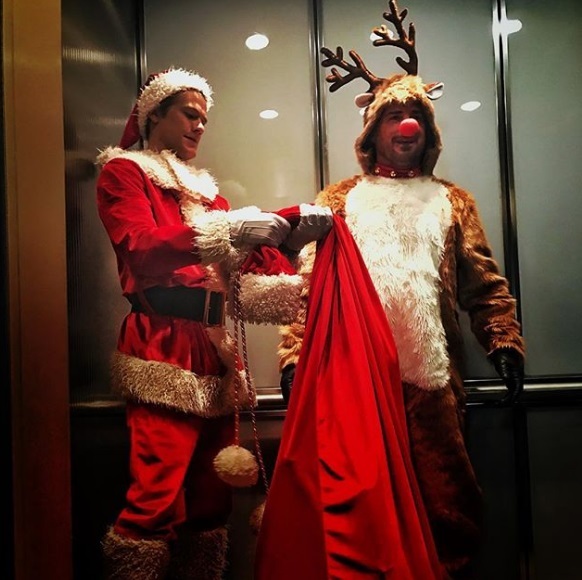 While we don’t know anything about the story yet, it brought us some hilarious BtS pictures – mainly of Mac & Jack wearing Christmas-appropriate costumes. 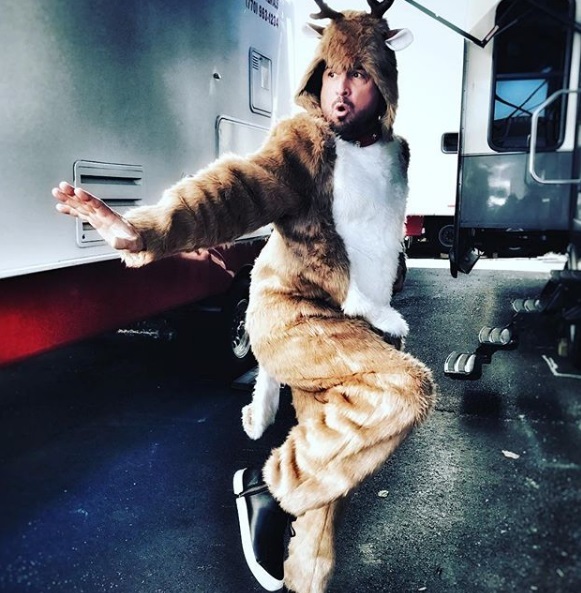 George Eads was the first to post pictures of him wearing a Rudolph costume. 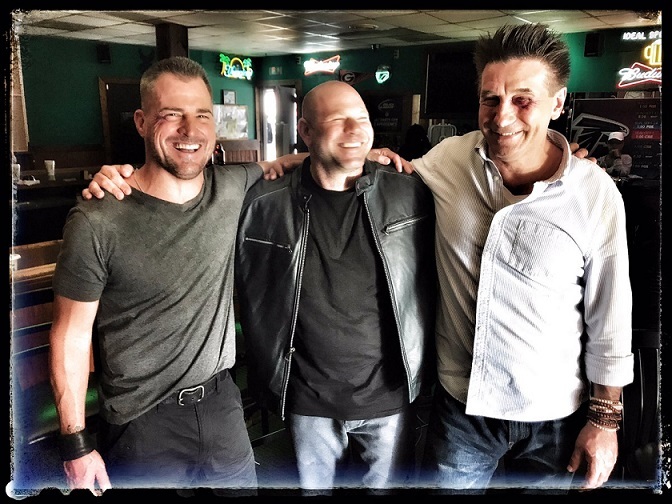 It didn’t take long for Executive Producer Peter Lenkov, Director Carlos Bernard and Lucas Till to join in. Lenkov also posted a picture of a train powered Record Player – definitely something you would find in MacGyver’s home. 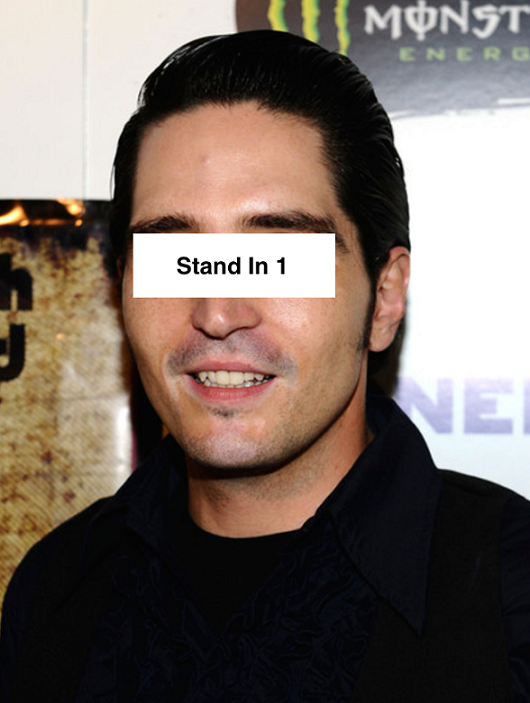 Interestingly, David Dastmalchian has been on set again recently. He posed for a Snapchat video with Justin Hires, looking all nice and normal. It’s most likely that Murdoc makes an appearance either in the Christmas Episode or in Episode 2×12 as the Midseason Finale. 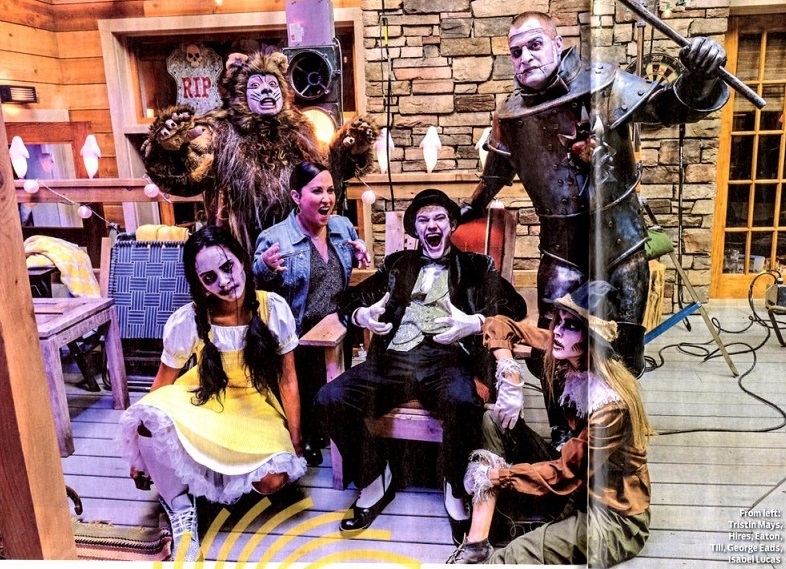 On October 11, TV Guide Magazine had revealed the first picture for the Halloween Episode 2×05 (Skull + Electromagnet) with the cast dressed up to fit The Wizard of Oz. We had already gotten to read the Press Release on October 9 and several Official Stills on October 17. Since the episode will air after the animated Michael Jackson Halloween Special (with Lucas Till and George Eads voicing characters; playing father and son), they take up the time slot of Hawaii Five-0 at 9pm. Of course, H50 fans are not happy – especially since the show has already shared BtS pictures of the traditional Halloween Episode. On October 23, CBS released the Press Release for Episode 2×06 (Jet Engine + Pickup Truck). There are no Official Stills yet, but fans of the Original Show might think the storyline reads a bit familiar because Mac and Team will travel to Nigeria to “stop a massive oil well fire”. This is an episode we got many BtS pictures of – mainly because of the Extras. According to SpoilerTV, Episode 2×07 (Duct Tape + Jack) will be aired on November 10. Episode 2×08 is titled “Packing Peanuts + Fire”; airing on November 17. As Justin Hires revealed in a recent Instagram Live Story Video, his character Bozer will have an exciting story arc through Episodes 8 to 10. We don’t know much about it yet besides Reign Edwards playing his potential love interest. We have seen pictures of them holding hands during filming, so we’ll see how this turns out. It looks like Reign has finished filming in Atlanta, so this might be another unhappy love story for Mac’s roommate. For Episode 2×03 (Muscle Car + Paper Clips), we got a trailer, Official Stills and 3 Sneak Peeks. 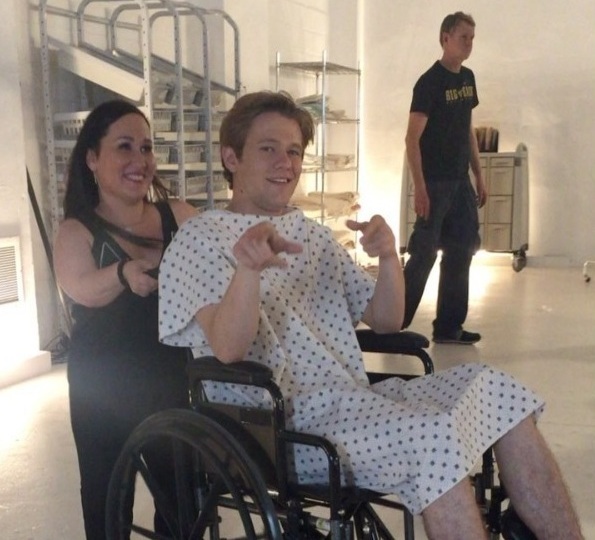 ET had visited the set while Lucas Till was working on Episode 2×04 (X-Ray + Penny). In the video, Lucas is crawling out of a manhole and stumbling alongside a traffic-heavy road. Last Friday, we were finally able to watch the episode this scene belongs to. 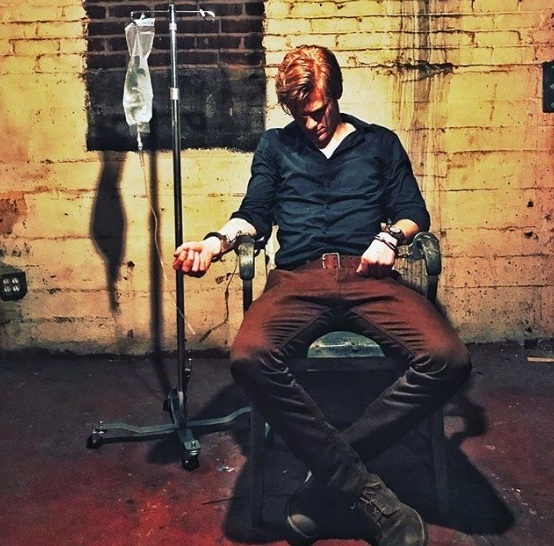 Sadly, while we had a trailer and Official Stills (all of MacGyver and Murdoc), there were no Sneak Peeks before Episode 2×04 aired. Luckily, the cast sweetened the days before and after the Premiere with some more BtS pictures. David Dastmalchian posted one of him and Lucas. Justin Hires posted several; e.g. of Bozer and Riley or of Bozer doing more detective work. 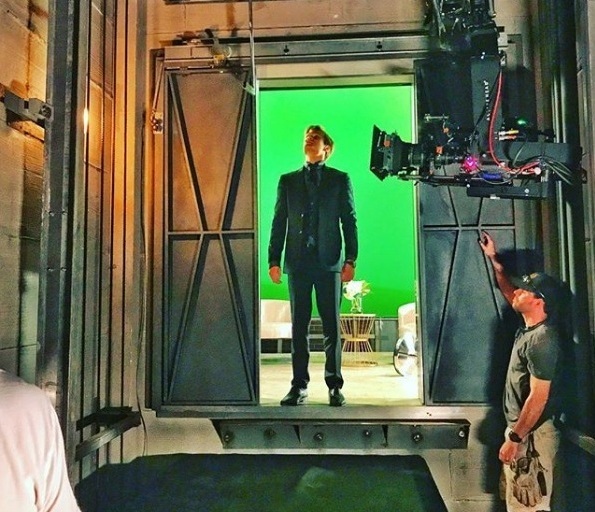 Director Bethany Rooney provided a BtS picture of Dastmalchian working in front of a green screen and of Lucas wearing the headgear-camera during MacGyver’s stint in Murdoc’s lair. 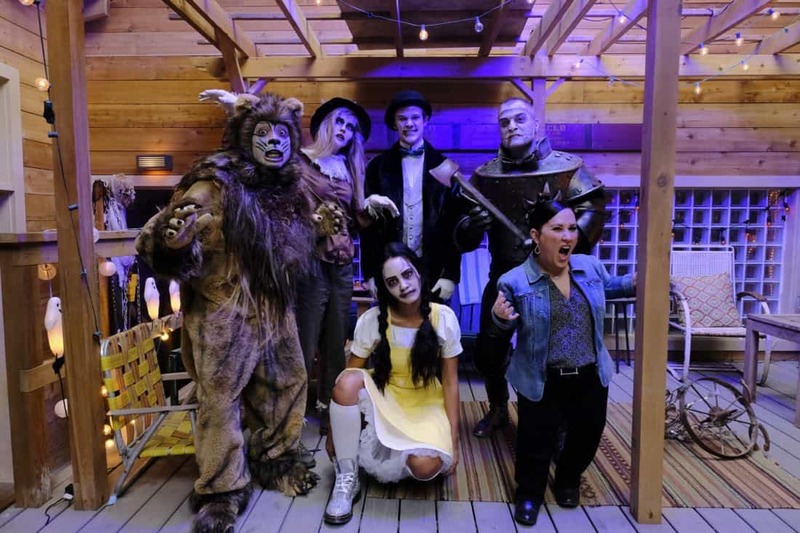 Gadgets wizard Mac (Lucas Till) and his special-ops team play undead versions of the beloved Wizard of Oz characters to entertain—or terrify?—trick-or-treating kids in the hit series’ special Halloween episode. “The cast was excited to dress up, but Justin Hires was plucking loose hairs out of his eyeballs all day!” costar Meredith Eaton recalls. “His costume was so hairy.” Sadly, the gang’s holiday plans are interrupted. Executive producer Peter Lenkov teases: “They’ll head into the Bermuda Triangle to retrieve the vice president’s son, whose plane disappeared.” Now that’s scary! 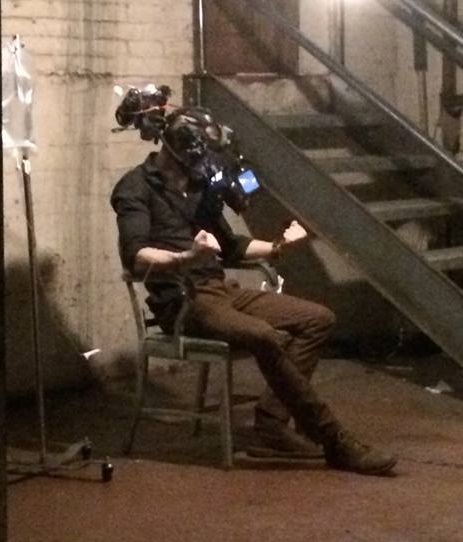 We also got some BtS picture in advance; e.g. of Director Elizabeth Allen Rosenbaum posing with Isabel Lucas or of Isaiah Stratton with Jeananne Goossen. Yesterday, we got 3 Sneak Peeks. One has Mac, Jack and Riley playing a prank on Bozer. Another one is the mission briefing in the War Room. The third one by TV Line shows Mac taking a phone call in the Bermuda Triangle. On October 26, CBS Watch! 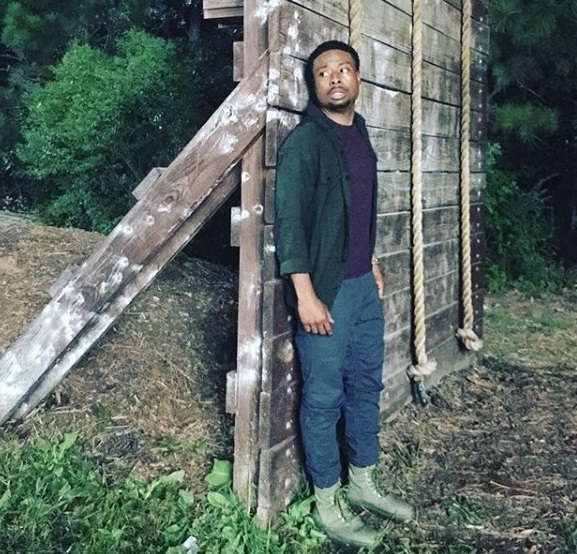 Magazine posted pictures of Justin Hires giving a “tour of typical MacGyver moments”. The short article helds 14 BtS Set pictures of Justin with various cast members. Some are of next week’s Episode 2×06 (Jet Engine + Pickup Truck). We also get a glimpse of presumably Jack Dalton’s “homebase”. We saw BtS pictures of the cast doing a photoshoot on this set a while ago. It’s not yet clear if those were done for another photoshoot and if they also did interviews for more promo that day. While the recent ratings haven’t been stellar or overwhelming, it’s interesting how stable they are: Episode 2×03 (Roulette Wheel + Wire) managed 6.74 million live viewers with a rating of 0.8 in the 18-49 demo; winning the 8pm time slot. Episode 2×04 (X-Ray + Penny) reached 6.77 million live viewers, also with a rating of 0.8 in demo; again winning the time slot for total viewers numbers. On average, Season 2 pulled in 6.65 million live viewers per episode so far with a rating of 0.8. As expected, that’s less than for Season 1 (7.73 million live viewers per episode with a demo of 1.08), yet the show didn’t lose as many viewers as other Non-Friday-Shows. Compared to another Reboot, Lethal Weapon already lost 1.5 million live viewers since last season. 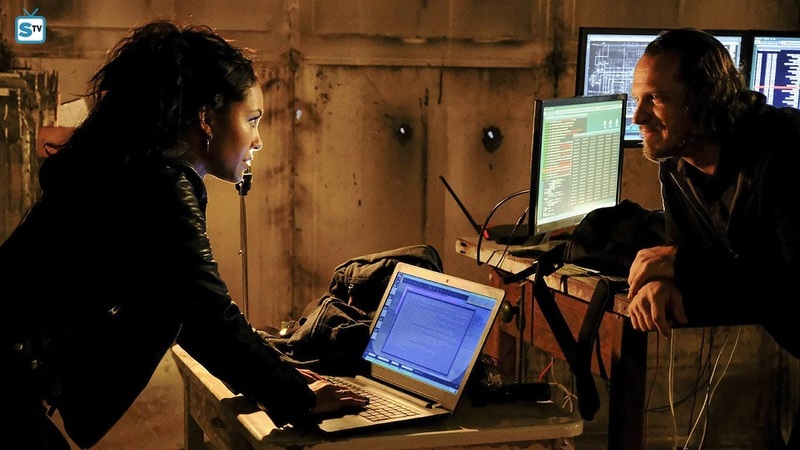 Other CBS shows like Scorpion lost almost 2 million live viewers per episode. The Rerun of Episode 1×11 (Scissors) on Saturday, October 14 generated 2.6 million live viewers with a demo of 0.4. That’s only half of the viewers that reruns usually generate on Fridays, but it was also in competition with sports programming. Although Isabel Lucas has the third spot in the opening title credits, there’s still no picture of her and no information about her on the official show website. Considering that she’d joined the team as a regular, that seems a bit unfair; even if they decide to write her off within the Season (which probably won’t happen). Emerson Brooks (who played Charlie Robinson in Episode 1×06: Wrench) was back on set yesterday. 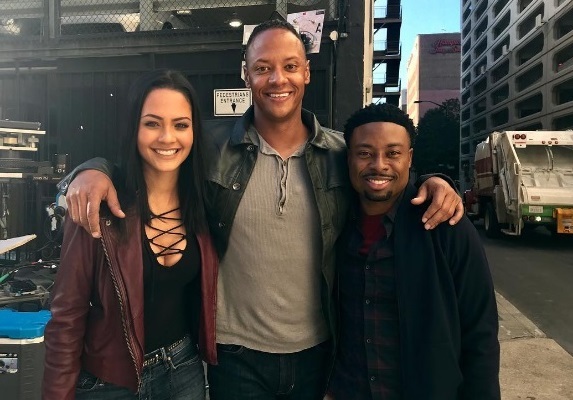 He posted a picture with Tristin Mays and Justin Hires today and was in some of Justin Hires’ recent videos. There have been Casting Calls for Bomb Squads recently, so it’s safe to assume that “The Ghost” will be back. Interestingly, Zoe Addison Smith (who had played Annabella Pena in the same episode), will be back for next week’s Episode 2×06 (Jet Engine + Pickup Truck). We don’t know yet if there’s a longer story-arc about MacGyver’s EOD teacher and commanding officer Pena or not. Someone had asked Anthony Starke (who played the “Bad Teacher” Fletcher in last week’s Episode 2×04) if he will be back. Anthony answered he doesn’t know, so apparently Fletcher didn’t make it into Murdoc’s collective after all. Central Casting Georgia has been looking for Stand-Ins, Photo Doubles, recurring Techs and Agents, Lab Techs, Fit Models (male and female), Bad Guys, Police, Desk Sergeants and Detectives, a hispanic Woman and kids for a Photo Shoot, female Agents, Policemen, Cops, LAPD, Bomb Squad, a Suspicious Man, FBI Agents and Office Patrons. They’ve also been looking for a Caucasian Man with darker hair for a Photo Shoot and for men with real military or tactical training. The Reboot starts airing in several Latin American countries this month. There were screenings recently – and in contrast to the US, distributor Universal Channel was quite inventive for these events. The press kits contained goodies like hats, licorice dynamite and even SAKs. 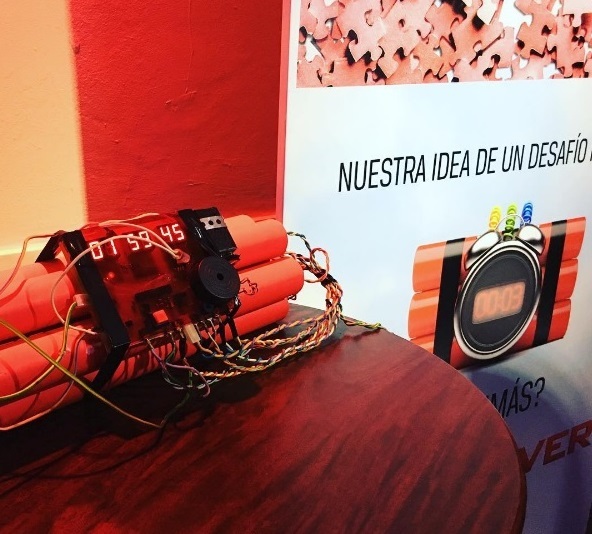 Depending on the venue, journalists gathered to conquer “MacGyverland” (Terra Mágica, Colombia) or had to disarm bombs (Argentina), solve puzzles, crack open a safe or to step over laser lights without getting “harmed”. There were fake missiles, confetti bombs and fighting stunt men. Must have been a fun event for journalists and reviewers to attend. Episodes 1×05 (Toothpick) and 1×06 (Wrench) managed 78’000 resp. 71’000 viewers. Episodes 1×07 (Can Opener) and 1×08 (Corkscrew) garnered 69’000 resp. 73’000 viewers. Since German channel Sat.1 skipped 3 episodes in total, the German-speaking TV-Premiere of the Christmas-Episode 1×11 (Scissors) – titled “Schnee in Kalifornien” (Snow in California) – will happen in Austria on November 11.
Who said Friday 13th is an unlucky day? A new episode airs tonight, so many people consider this as a win. While promo has quieted down a bit, cast and crew are busy filming more episodes. There wasn’t much promo until Premiere Day. It was kind of a special date because back in 1985, the Original Show also premiered on September 29. On September 21, the official Instagram Account by CBS had asked the fans to ask questions. There were over 370 comments when I was writing my last update two weeks ago, but it was only Meredith Eaton who had answered some of them via Instagram Live Videos shortly before the Premiere. Seems like CBS forgot about the rest. 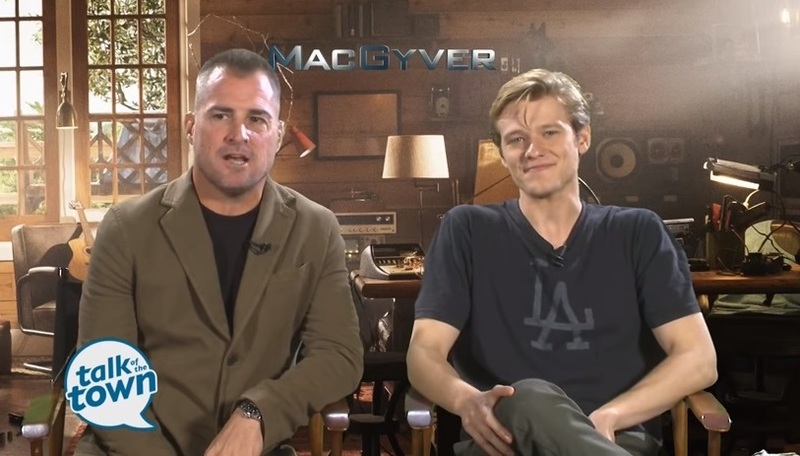 George Eads and Lucas Till did many video interviews for the local TV channels. They mentioned doing about 20 of these interviews, so it’s no wonder they seemed oddly hyperactive in some of them; probably suffering from lack of sleep. Talking about upcoming car chases with News Channel 5, Lucas joked that he doesn’t know why they keep letting George drive. In the segment for CBS Denver, they revealed that Murdoc will assemble several bad guys, so we might get to see more familiar sounding character names this season. 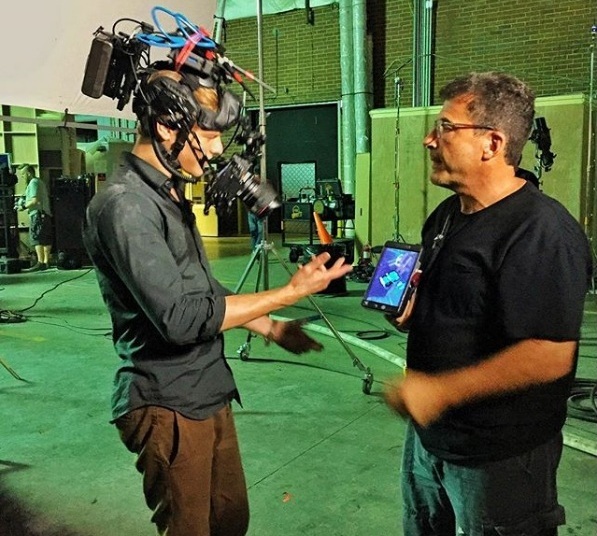 In the interview with CBS Baltimore, Lucas admitted that he didn’t let himself have that much fun on Season 1 because he took it much more seriously. I used Jack’s heart to keep a heart alive. It’s like a heart in a box pump that keeps hearts alive instead of transporting live organs on ice and it all ends up not being able to work and I use Jack’s heart to keep the heart pumping alive so we can get it into someone else. 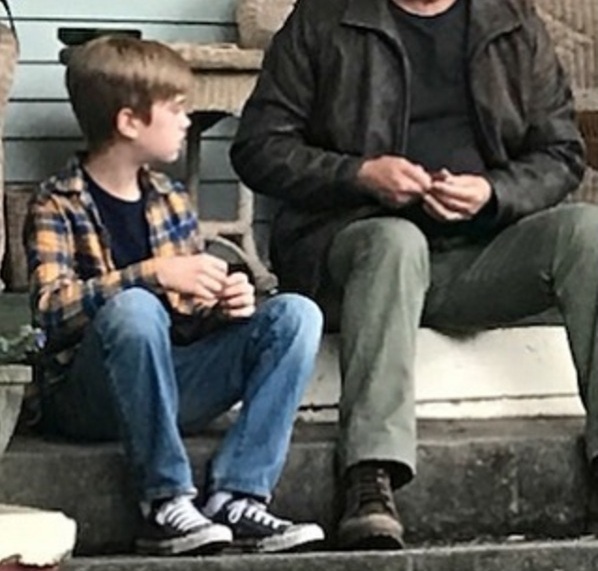 We can assume Lucas refers to Episode 2×07 (Duct Tape + Jack) – which means that “Jack” in the episode title is indeed Jack Dalton and not just another tool out of the tool box. I”m a lot better with my preparation. I had problems with my knees. But I’m all good now. Yoga really works. I’m on my feet 14 hours a day. It’s a beast. Me and Lucas are just good friends. It starts with respect. When you spend as much time as we do on the set with one another, he knows how hard it is for me, and I know how difficult the show can be for him. We try to pick each other up, bring each other a protein shake, or take a break if one of us needs one. There’s been times when I’ve been missing my daughter so bad that I’ll be in an emotional state, and Lucas will hold up production until we can talk it out and maybe even cry it out in the trailer. I confide in him as a close friend, and I think he’s done the same for me. I’ve gotten to know his mom and dad and his brothers. When you spend a lot of time working, you cross your fingers that you’re gonna like each other, and we’ve just been lucky when it comes to that. And the more our friendship evolves, the more our characters do too. On October 3, SpoilerTV presented us Press Releases and Stills for Episodes 2×02 (Muscle Car + Paper Clips), 2×03 (Roulette Wheel + Wire) plus 2×04 (X-Ray and Penny). 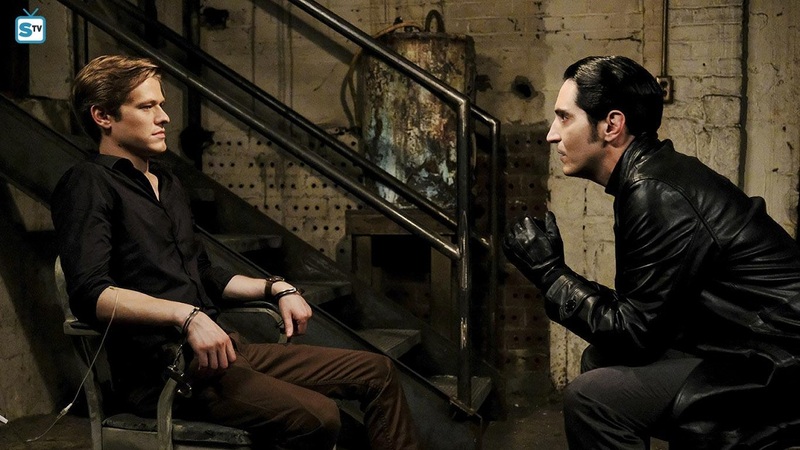 In Episode 2×04, we’ll encounter David Dastmalchian as Murdoc again and will meet Michael O’Keefe as Harry MacGyver. On October 9, we got the Press Release of the Halloween Episode 2×05 (Skull + Electromagnet). Since the episode will air after the animated Michael Jackson Halloween Special (with Lucas Till and George Eads voicing characters), they will take the time slot of Hawaii Five-0 at 9pm. H50 also filmed a Halloween Episode, but apparently they’ll have to wait. On Premiere Day, SpoilerTV had released three Sneak Peeks for Episode 2×01 (DIY or DIE). I had been wondering about the lack of promo for the second episode and them deleting the preview that had already aired after Episode 2×01. As it turned out, CBS had changed the episode order for several shows (probably due to recent events in Las Vegas). They uploaded a generic preview we’ve already seen for last season. Sadly, there were no additional Stills or Clips besides the four Stills of Riley in the bad guys’ lair. For Episode 2×03 (Muscle Car + Paper Clips), they re-uploaded the preview we’ve already seen, but with a slightly different background music. Additionally, we got 3 Sneak Peeks today. One has Mac and Jack stuck in an Ice Cave, trying to turn a snow mobile into a radio. This might turn out as the Opening Gambit and reveals another tidbit about MacGyver Senior’s watch he left behind. Another one has Team Phoenix trying to overcome several obstacles in their Casino Heist. The third clip has Riley and Mac pretending to be a couple who needs some help with their handcuffs shenanigans gone wrong. The clips are interesting, but I find it odd that they’ve chosen to show an entire Opening Gambit again. 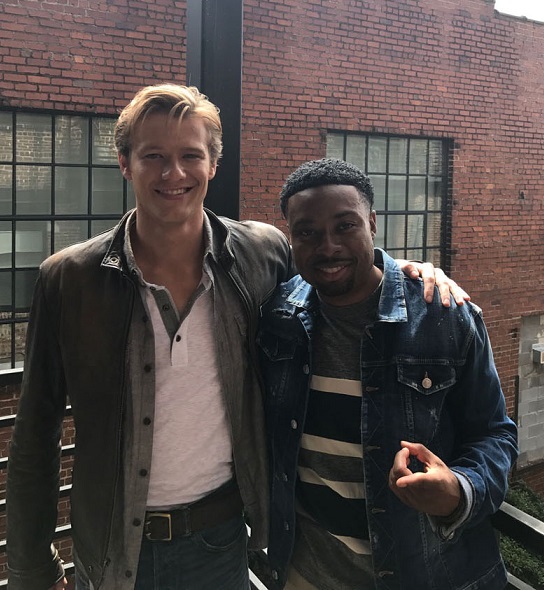 ET visited the set and did a short interview with Lucas Till who was working on Episode 2×04 (X-Ray + Penny). In the video, Lucas is seen crawling out of a manhole and stumbling alongside a traffic-heavy road. The segment was rather short, but we also got to see his Stunt Double Mike Wilson. Since the Premiere, many took the opportunity to post new BtS pictures of Episode 2×01; e.g. Danny Boushebel (posing with Isabel Lucas) or Ricky Russert who shows in a video why it takes over 3 hours to get him a beard worthy of a long-term prisoner. On October 11, we got a first picture for the Halloween Episode 2×05 (Skull + Electromagnet) via TV Guide Magazine. As suspected, the cast will dress up in an impersonation of The Wizard of Oz. The main unit had been filming outside a lot on some interesting looking sets; e.g. on an obstacle course and at Atlanta Water Works. 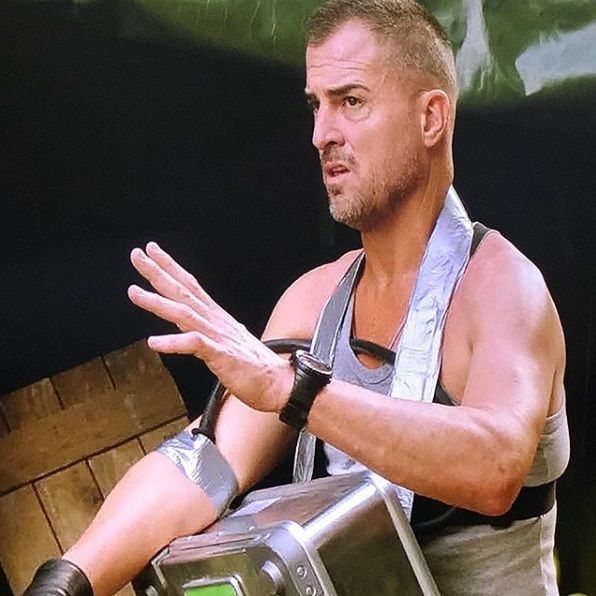 Director Bobby Roth posed for pictures with George Eads, Isabel Lucas or Tristin Mays while director Stacey Black started post production on Episode 2×08. Justin shared more BtS pictures of Bozer and various team members of Team Phoenix in the War Room. Judging by recent BtS pictures and videos from set, his character will undergo some physical training and find a new love interest. 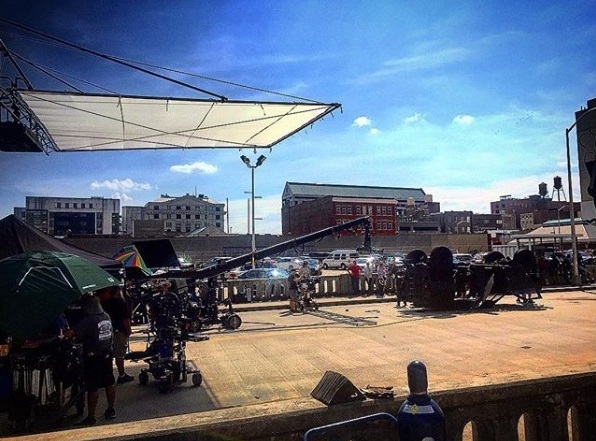 Grip Thomas Doolittle and Boom Operator Robert Maxfield shared some pictures while filming more car scenes. Cast and Crew also continued posing for pictures with set dog Einstein. If there are no dogs available to play with, there’s also Lego sets. Today, Tristin Mays uploaded a video of Lucas building a Lego NinjaGo pirate ship. Meanwhile, Peter Lenkov was busy editing. He didn’t share many pictures and videos, but quite a few Instagram Live Stories of the editing process. We will see Jack and Riley in trouble, Bozer sneaking around houses in the dark and another stare-off between MacGyver and Murdoc. Before the premiere of Episode 2×02 (Muscle Car + Paper Clips) on October 6, cast and crew shared some more BtS material. It seems like Lucas was especially fond of the Mustang that played an important part in this episode. 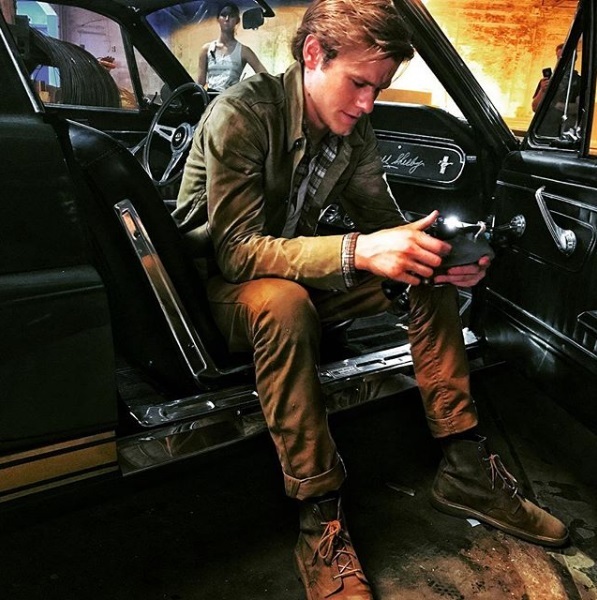 Meredith Eaton shared a picture of the Arcade scene; George Eads on of Mac and Jack sitting in a car. Season 1 had an average rating of 1.08 in the important demo group (18 to 49-year-olds) and about 7.7 million live viewers per episode. The Season 1 Finale had a rating of 0.9 and about 6.6 million live viewers. Rating pages like The Grim Reaper claim that Season Premieres nowadays usually reach the same ratings as the last Season Finale. This seems to be true for the Reboot: Episode 2×01 (DIY or DIE) managed 6.7 million live viewers with a rating of 0.8 in demo; winning the 8pm time slot. Episode 2×02 (Muscle Car + Paper Clips) reached 6.4 million live viewers, also with a rating of 0.8 in demo and winning the time slot for total viewers numbers. Although Isabel Lucas got the third spot in the opening title credits, there was no official press release about her joining the Season 2 cast. In TV Guide Magazine (released online on TV Insider), Lucas Till and George Eads talked a bit what Season 2 will bring. George stated that we will meet Riley’s dad (which was recently mentioned by Executive Director Peter Lenkov on Instagram as well). There has been some speculation that Roger Floyd would play Riley’s father, but as it turns out, it’s actually Billy Baldwin. As we can see in BtS pictures, there might be some fists and black eyes. As seen in Instagram Videos by Peter Lenkov and through various Instagram Live Stories and pictures, we will also meet Bozer’s new love interest, played by Reign Edwards. In an interview with Entertainment Weekly, Executive Producer Peter Lenkov again said that Original MacGyver Richard Dean Anderson won’t play Mac’s father because it would be too obvious. 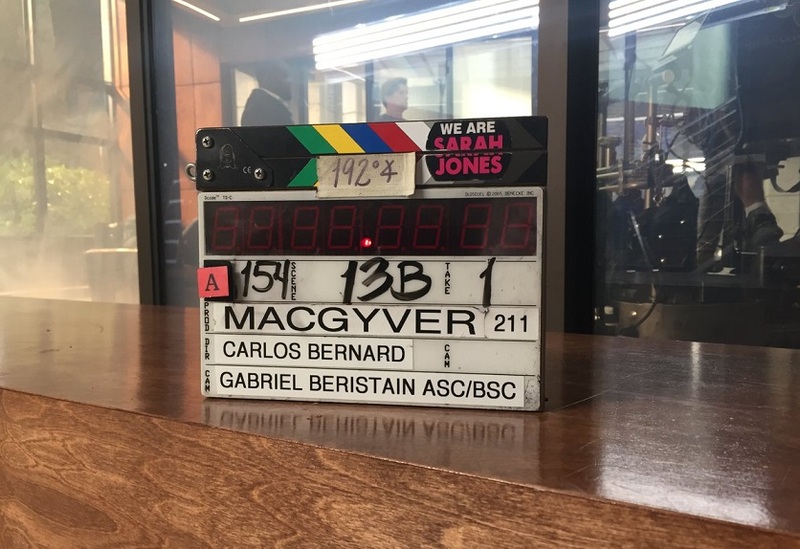 He also teased that “it’s not who you think it is” which probably means that MacGyver Senior has already been cast since we will meet him at the end of the season. Central Casting Georgia has been looking for Stand-Ins, Photo Doubles, SWAT People, for Arcade Employees, Upscale Restaurant Patrons and Hostesses, Goons, Bartenders and Waitresses, Rural Country Vehicles, Trainees, College Students and for Techs and Agents. On September 27, Tawnia Canell McKiernan had revealed that she’s packing to leave for Atlanta to direct Episode 2×10 (War Room + Ship). Episode 2×11 (Bullet + Pen) will be directed by Carlos Bernard who just came back from Hawaii after directing an episode on Hawaii Five-0. There will be a rerun of Episode 1×11 (Scissors) tomorrow Saturday (October 14, 8pm). There is still no US-release date for the Season 1 DVD although fans keep asking about it. While Episode 1×04 (Wire Cutter) reached 56’000 viewers, Episodes 1×05 (Toothpick) and 1×06 (Wrench) managed 78’000 resp. 71’000 viewers. Contrary to German channel Sat.1, Austria won’t skip episodes. Therefore, the German-speaking TV-Premiere of Episode 1×11 (Scissors) – titled “Schnee in Kalifornien” (Snow in California) – will happen in Austria on November 11.